I feel like the Kathy Griffin of Louisville fine dining. Griffin achieved comedic fame by exploiting her “on the periphery” celebrity. She’s famous enough to make it to red carpets, but D-list enough to be ignored by bigger-name stars. Having the “food blogger” label attached to my name has gotten me into some events that I would never have exposure to otherwise. But I still feel like an outsider, the dorky kid who somehow made it to the popular kids’ lunch table because a cheerleader owed her a favor. Case in point, Taste of Louisville. Last week’s event gave attendees the chance to sample some of the city’s most creative cuisine from notable restaurants. These are the types of places that serve ping-pong ball-sized entrees in the middle of blinding-white plates. It was a huge departure from my usual $10 Challenge meals. I stood out at Taste of Louisville from the start, and not just because of my honkin’ “Press” badge. The theme of this year’s event was “Speakeasy,” a nod to the Roaring 20s, so there were plenty of gals in flapper dresses and guys in zoot suits. Two Taste of Louisville attendees in full 20s gear. Heads cropped out to protect the innocent. I, however, wore skinny jeans, flats and a cardigan, aka my “trying to look nice” uniform. 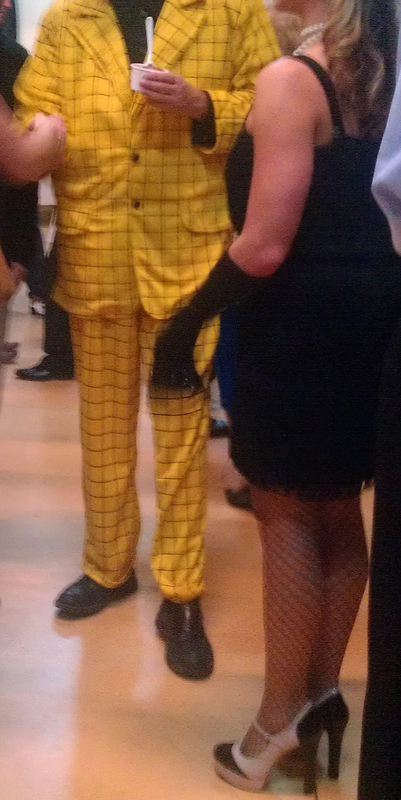 Who knew folks would stick to the theme, even with their wardrobe? General awkwardness continued throughout the night as I Tweeted and took pictures with my phone with one hand, balancing tiny plates with of bite-sized goodies in the other, and stuffing my clutch purse with business cards and menus from the vendors. Then, on a stop in the ladies’ room, I discovered a sprig of something green stuck in my teeth. Who knows how long it was there and how many servers recoiled as they handed me an hors d’oeuvre. That marked the point in the evening when I threw up my hands to trying to fit in with this upper-crust crowd and just be the best budget food blogger I could be. Speaking of which, let’s talk about the food. I would highly recommend saving up the $55 to attend Taste of Louisville next year. This event gave me an opportunity to try foods from excellent local restaurants that I would never have had exposure to otherwise. 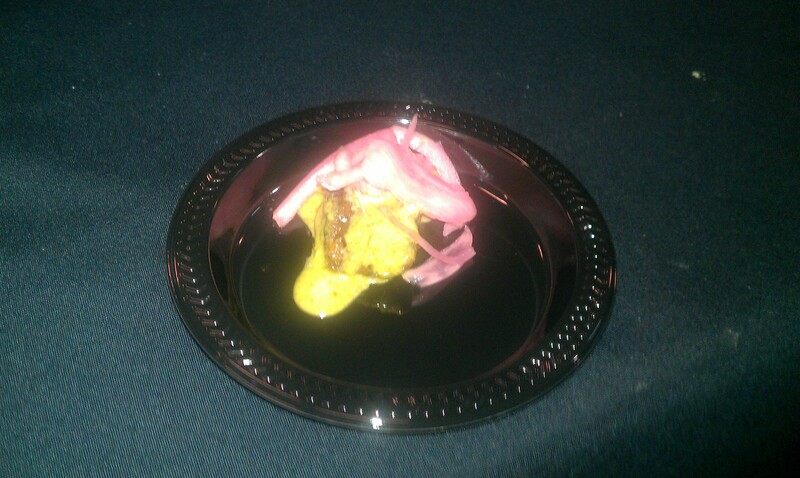 My favorite dish of the night was the chipotle-marinated skirt steak with cilantro-jalapeno mayo and pickled red onions from Varanese. I’ve never had a piece of meat that was so tender and injected with spicy flavor. Bristol Bar and Grille’s cranberry bread pudding was divine. My little bite was moist and just sweet enough to wipe my palate of the more savory dishes of the evening. Mitchell’s Fish Market might win Ashlee Eats award for “Best Dish — Not Local Division.” I may or may not have made multiple trips to this restaurant’s booth for its crab cakes. At events like Taste of Louisville, pay attention to which tables are the busiest and which are having a tough time attracting a crowd. That’s how you can find the good food and avoid the culinary missteps. I was happy to see Kern’s Kitchen at the event, the makers of Derby Pie. It’s nice to have the dish in its non-battered form. The “Most Pleasant Surprise” award goes to SaE Cafe, a breakfast and lunch spot in downtown Louisville. In a sea of hot entrees, this cafe’s platter of cold sandwiches was a nice, lighter alternative. I had a couple of helpings of their Mexi Mama wrap, a mix of ancho-chile cream cheese, lettuce, tomato, pepper jack cheese, green pepper, turkey, avocado spread and red onion.